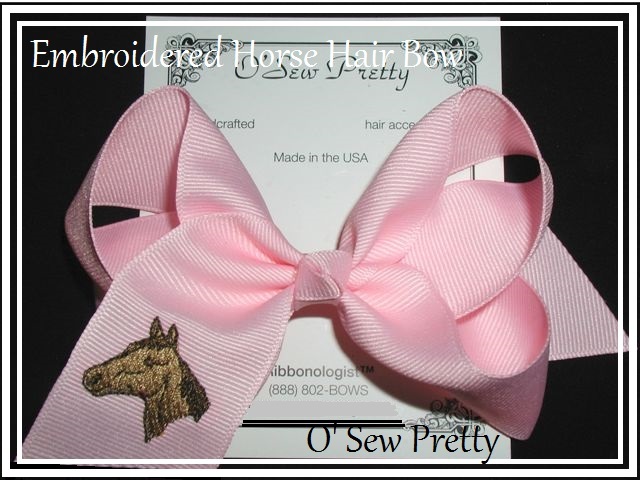 A Embroidered horse that you choose the colors to make it a perfectly matched hairbow. This embroidered hair bow come in three sizes. This website and all of it's contents including but not limited to the photographs and the art work on hair bow cards are protected by copyright laws and may not be reproduced or copied in anyway without express written consent from O' Sew Pretty Hair bows are not toys and may contain small parts. Infants and children should not be allowed to play with hair bows.